Rated a three-star prospect by Rivals, 247Sports, and ESPN … listed as the No. 3 offensive guard in New Jersey by 247Sports … BC signed the No. 2 and No. 3 offensive guard prospects in the Garden State according to 247Sports in the 2019 recruiting class … rated as the third-best offensive tackle and New Jersey’s 30th overall prospect by Rivals … the No. 2 offensive guard prospect in New Jersey according to ESPN … rated the state’s 28th-best prospect by ESPN … part of a Paramus Catholic team that won the 2016 Non-Public, Group 4 state championship … team captain … All-Super Football Conference first-team selection as a senior … 2018 All-Bergen County first-team selection. Rated the top weakside defensive end in Ohio according to 247Sports … ranked as a three-star recruit by 247Sports, ESPN and Rivals … listed as the No. 25 player in Ohio and the nation’s No. 45 weakside defensive end by 247Sports … rated as the No. 30 prospect from the state of Ohio by ESPN … picked up all-district first team and all-state third team recognition … posted 53 tackles, seven sacks and forced one fumble as a senior … son of Tracy Knue and Rick Bono … hails from the same high school as current Boston College special teams coordinator and former BC and NFL linebacker Ricky Brown … played for head coach Doug Ramsey at Elder. Rated as the No. 64 defensive tackle nationally and the No. 2 defensive tackle prospect in New Jersey according to 247Sports … rated the No. 20 prospect in New Jersey by 247Sports … listed as the third-best defensive tackle in New Jersey by ESPN … rated the No. 36 player in the Garden State and the 85th-best defensive tackle nationally according to ESPN … missed his junior season due to a knee injury … played for head coach Brian Carlson at Pope John XXIII … former high school teammate of current BC freshman linebacker Nick DeNucci … 52 tackles and two sacks as a senior, including a season-high 10 tackles against Paramus Catholic and Seton Hall Prep … team captain as a senior … all-conference and all-county selection … son of Susan Bassaragh. A three-star prospect by 247Sports, ESPN and Rivals … ranked as a top-10 prospect in Connecticut by all three outlets and as high as No. 6 by Rivals … started all 13 games as a senior for a 10-3 New Canaan team that reached the state championship game … named all-state and all-conference first team offensive tackle as a junior and senior … added three sacks on the defensive side of the ball … son of Doreen and Bill Conley … team captain … comes from the same high school as Boston College All-America defensive end Zach Allen … played for head coach Lou Marinelli at New Canaan. Ranked as a three-star prospect by 247Sports, ESPN and Rivals … rated as the No. 28 recruit out of the state of Michigan … led De La Salle to back-to-back state championships with a 12-win season in 2018 … provided 44 tackles, 3.5 tackles for loss, five interceptions and 20 pass deflections as a senior … ran the ball for 243 yards on 38 carries with three touchdowns and caught 36 passes for 770 yards and nine scores in 2018 … played for head coach Mike Giannone at De La Salle. A three-star recruit according to 247Sports, ESPN and Rivals … rated the No. 83 wide receiver nationally by Rivals … listed as the No. 116 athlete nationally and the No. 179 player in Florida by ESPN … listed as the No. 184 prospect in Florida by 247Sports … helped guide the Sharks to back-to-back Florida Class 4A state semifinal appearances as a junior and senior … played both wide receiver and defensive back at University School, but will play at cornerback at Boston College … played for head coach Daniel Luque at University School … son of Willie Flowers and Malika Palmer. The top-rated running back in Pennsylvania and the nation’s 30th-best running back according to 247Sports … rated as the No. 8 prospect overall in Pennsylvania by 247Sports … Pennsylvania’s highest-rated running back according to Rivals.com and the state’s No. 9 overall prospect … regarded as the nation’s No. 21 running back recruit by Rivals.com … third-best prospect overall in the Keystone State and the state’s top running back according to ESPN … listed as the No. 29 running back in the country by ESPN … set the single-season school record for rushing with 1,879 yards as a junior, breaking the mark held by Steve Slaton … led the Eagles to the PIAA Class 3A semifinals as a junior, the best finish in school history for Conwell-Egan … led his team to the PIAA Class 3A quarterfinals as a senior with a 13-1 record … broke his own school record with 1,922 yards and 29 touchdowns his senior season … Bucks County Player of the Year as a junior and senior … left as the school’s all-time scoring leader … played for head coach Jack Techtman at Conwell-Egan … captain as a junior and senior … led his team to the Philadelphia Catholic League championship as a junior and senior … son of Patrick and Linda Garwo. Rated the No. 1 safety in New Jersey according to ESPN … rated as the No. 32 prospect overall in the Garden State and the 82nd-best safety nationally by ESPN … No. 21 overall player in New Jersey according to 247Sports and the nation’s No. 78 safety … NJ.com second-team all-state selection as a senior … finished with 55 tackles, 38 solo, and three interceptions … defended 18 passes from his safety position … led St. Joseph’s to the state championship with a 13-0 win over Bergen Catholic … St. Joseph’s finished the year as the No. 1 team in New Jersey … USA Today first-team all-state selection as a senior … all-North Jersey selection by the Bergen Record … former high school teammate of current BC freshman linebacker Evan Stewart… played for former BC standout Augie Hoffman at St. Joseph’s Regional … team captain … team finished the season ranked No. 19 nationally … North Jersey Sports Defensive Player of the Year as a senior … son of Todd and Marie Grieco. Rated as the No. 2 defensive tackle and New Jersey’s 14th-best overall prospect according to ESPN … three-star prospect according to ESPN, Rivals, and 247Sports … led the Seraphs to a 10-2 record and finished as the runner-up to Red Bank Catholic in the Non-Public Group III championship game … helped guide his team to the Shore Conference Patriot Division championship as a senior, the school’s third consecutive division title … Asbury Park Press all-area first-team selection on a Mater Dei defense that recorded three shutouts and had four other games allowing eight points or less … 60 tackles, nine sacks, two fumble recoveries, one forced fumble, and a touchdown … Shore Conference Patriot Division Defensive Player of the Year … USA Today first-team all-state selection … played for head coach Dino Mangiero at Mater Dei Prep … son of Danielle Henderson … team captain … scheduled to enroll in January at Boston College … one of two Mater Dei Prep standouts to sign with Boston College, joining teammate Shitta Sillah at the Heights. Rated a four-star quarterback by ESPN and the 226th ranked prospect in the ESPN300 … a three-star recruit by both 247Sports and Rivals … rated as the No. 12 quarterback nationally by ESPN and the No. 5 recruit out of Michigan … earned all-conference honors, while guiding team to city and district championships and a regional final appearance … threw for 2,115 yards and 23 touchdowns to just five interceptions and rushed for 263 yards and five scores as a junior… son of Shawnda and Sam Johnson … scheduled to enroll in January at Boston College … played for head coach Alex Grignon at Walled Lake Western. Three-star prospect according to ESPN who is rated as the No. 40 dual-threat quarterback nationally … one of the top prospects in New Jersey who will play at safety for Boston College … father Steve and his uncle Nick both played football at Boston College in the early 1980s … one of the key players in Red Bank Catholic’s drive to an undefeated season and the NJSIAA Non-Public Group II championship as the state’s top-ranked team … Asbury Park Press all-area first-team selection and USA Today all-state first-team honoree … 85-of-122 passing (69.6% completions) for 1,678 yards and 21 touchdowns … also rank for 377 yards and seven touchdowns en route to being named the Shore Conference Freedom Division Offensive Player of the Year … led the Caseys to their first unbeaten season since 1960 … team captain … son of Steve and Diane Lubischer … played for head coach Frank Edgerly at Red Bank Catholic. Ranked as a three-star recruit by 247Sports, ESPN and Rivals … rated as the No. 31 prospect from Ohio by Rivals … earned all-state second team and all-district first team honors … named first team all-conference and the Ohio Capital Conference Player of the Year … son of Emily and John Ness … played for head coach Joel Cutler at Upper Arlington … team captain … two-way starter on the offensive and defensive lines. A three-star recruit by 247Sports, ESPN and Rivals who is rated as the third-best offensive guard in New Jersey by ESPN … rated as New Jersey’s 29th-best overall prospect and the 67th-best offensive guard nationally according to ESPN … No. 31 player overall and the state’s No. 3 offensive tackle according to Rivals … second-best offensive guard in New Jersey by 247Sports … listed as the No. 34 overall prospect in the Garden State and the nation’s No. 79 offensive guard by 247Sports … played both ways and on special teams throughout his high school career … former high school teammate with current Boston College freshman linebacker Vinny DePalma … as a junior, part of a DePaul Catholic squad that won the Non-Public Group III state championship … played for head coach John McKenna at DePaul Catholic … son of Besim and Fatima Rustemi. A three-star recruit by 247Sports, ESPN and Rivals … rated as a top-10 prospect in the state of Connecticut by all three outlets, including a high of No. 7 by 247Sports … No. 2 wide receiver in Connecticut according to 247Sports and the nation’s No. 85 prospect at wide receiver … rated as the No. 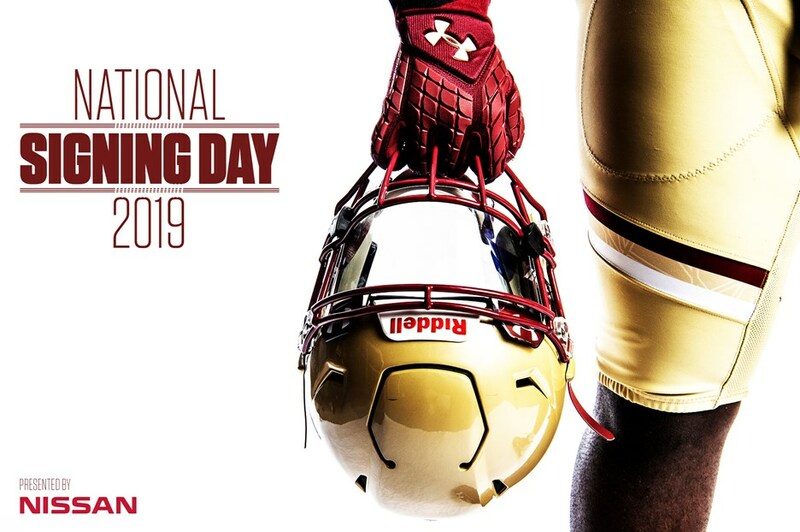 1 athlete in Connecticut by ESPN … brother Brandon plays cornerback at BC … son of Mayra and Craig Sebastian … played for head coach Dave Dykeman at Cheshire. The number one outside linebacker prospect in New Jersey according to 247Sports and New Jersey’s ninth-best prospect … three-star recruit who is rated as New Jersey’s No. 2 outside linebacker according to ESPN and Rivals … No. 15 overall player in the Garden State according to ESPN … rated by Rivals as the No. 14 player in New Jersey … helped guide the Seraphs to a 10-2 record and finished as the runner-up to Red Bank Catholic in the Non-Public Group III championship game … key part on a team that won the Shore Conference Patriot Division championship as a senior, the school’s third consecutive division title … Asbury Park Press all-area first-team selection on a Mater Dei defense that recorded three shutouts and had four other games allowing eight points or less … 52 tackles, 10 sacks and a fumble recovery as a senior … USA Today first-team all-state selection … played for head coach Dino Mangiero at Mater Dei Prep … son of Abdulai and Abbey Sillah … one of two Mater Dei Prep standouts to sign with Boston College, joining teammate Izaiah Henderson at the Heights. A three-star prospect by 247Sports, ESPN and Rivals… ranked as the No. 21 prospect from Maryland by ESPN and No. 24 by 247Sports … owns the Maryland state record for career touchdown receptions with 53 … helped team to 10-1 record, including a 9-0 mark in regional play, in 2018 … all-county first team member with 992 receiving yards and 22 touchdowns as a senior … Capital Gazette Player of the Year … finished his career with a county-record 3,222 receiving yards; beating the previous record by over 500 yards … totaled 53 career touchdowns and 196 catches; both county records … team captain … son of Michele Ladson and Troy Williams … will enroll at Boston College in January … played for head coach Rob Harris at Broadneck. Ranked a three-star prospect by 247Sports, ESPN and Rivals … rated as the No. 17 recruit out of Maryland by ESPN … helped the Landon School to a 9-1 record as a senior … team captain as a senior … four-year varsity starter who was a three-time all-conference selection, including first-team honors as a junior and senior … team defensive MVP as a senior and first-team All-Met selection … posted 56 tackles, 1 1/2 sacks, three interceptions and a fumble return for a touchdown as the co-IAC-champion Bears held opponents to an average of 200 yards per game as a junior … son of Roz and Jeff Williams … played for head coach Paul Padalino at the Landon School.